An efficient, resilient communication infrastructure is key to utilities’ ability to control and maintain electrical power distribution and manage equipment in the grid. Success depends on a communication platform and protection system that can accommodate utilities’ changing needs. Traditionally, utilities have relied upon synchronous optical network (SONET), synchronous digital hierarchy (SDH) and other time-division multiplexing-based solutions (TDM) to support grid operations. However, TDM infrastructures are no longer able to provide the flexibility, efficiency, and security necessary to support new smart grid technology and other technological advancements. This has led to the adoption of an internet protocol (IP) standard called multiprotocol label switching (MPLS), a data-carrying technique for high-speed, high-performance telecommunication networks and enterprise users. MPLS uses packet labeling for faster packet forwarding on networks. This allows companies to control and prioritize network traffic by managing network capacity and flexibly rerouting data exchanges. It also streamlines operations. Utilities’ critical operational communications continue to develop and utilities must be able to reliably these meet new pressures. For example, IP/MPLS supports important transmission system operator (TSO) applications like supervisory control and data acquisition (SCADA) and line differential protection applications. SCADA’s primary task is to obtain data from remote devices. It relies on a communication network to relay data from remote locations to the SCADA host. If a SCADA system is not able to control communications to assets, it will not be successful. Packet transport like MPLS allows for a more easily managed, secure, real-time exchange of critical information. MPLS networks provide the communication framework needed to support teleprotection applications’ performance requirements. For instance, utilities protect T&D lines from medium to extra high voltage levels using line differential protection. To do this, relays at all line ends must have a reliable data exchange. Using MPLS networks for line differential protection applications not only provides this reliably, but also improves data alignment, measuring accuracy, and operation consistency. In addition, because of its self-adaptive algorithm, a modern numerical relay will continue to function even when severe asymmetrical latency or high jitter occurs. Intensive tests have been carried out to validate the performance of the protection function under such conditions as well as being able to manage real-time communication network topology changes. Communication will always be at the heart of utilities, so it is imperative to adopt technology like MPLS that can support both existing networks and accommodate innovations such as smart grid technology. 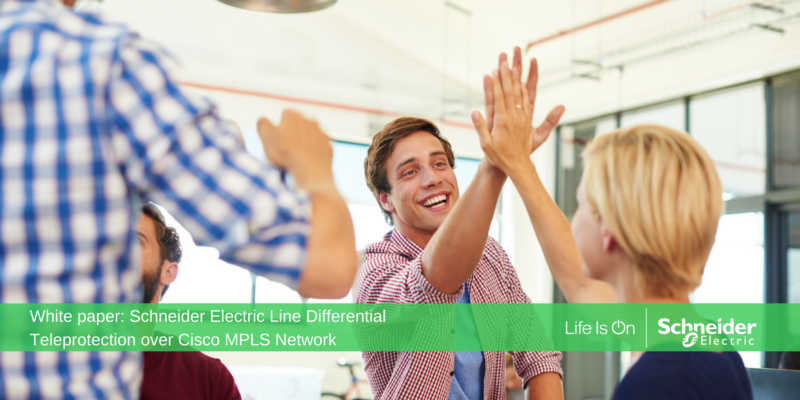 Read our latest white paper Schneider Electric Line Differential Teleprotection over Cisco MPLS Network to learn more.